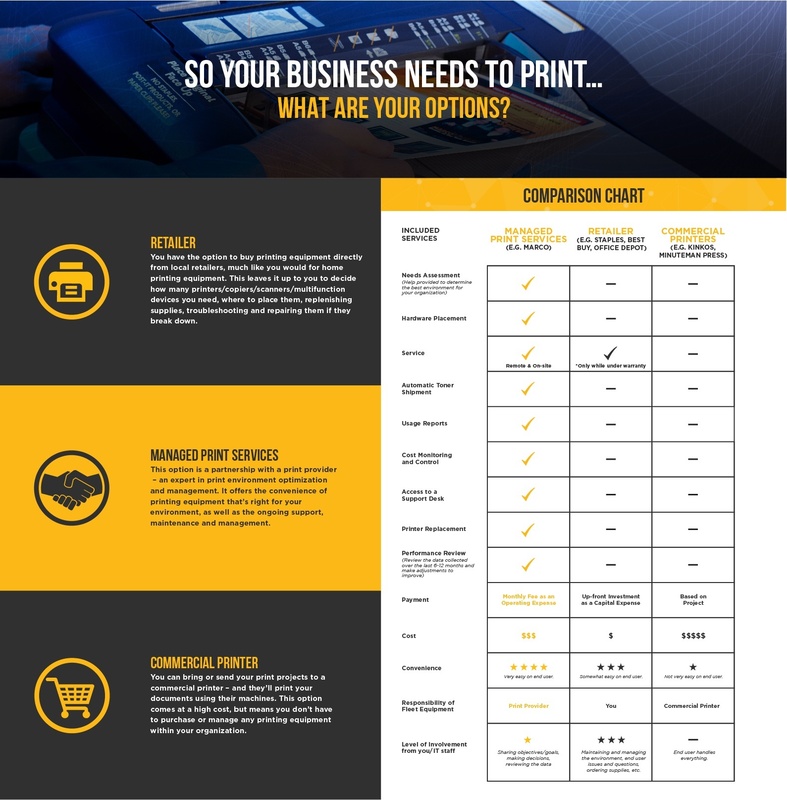 Printing is an essential function in most retail businesses – but there is flexibility in how each business approaches printing. And, the approach you choose will affect your cost, level of responsibility and effectiveness. In turn, each of those variables influences future ROI, productivity and workflow. Managed print services is a program offered by print providers that manage all aspects of your business printing devices, including printers, scanners, faxes and copiers. But, it's not the only option for businesses. Working with retailers or commercial printers is also an option for businesses. Managed print services (MPS) are services offered by an external provider to optimize or manage a company’s document output. The main components provided are needs assessment, selective or general replacement of hardware, and the service, parts and supplies needed to operate the new and/or existing hardware (including existing third-party equipment if this is required by the customer). The provider also tracks how the printer, fax, copier and MFP fleet is being used, the problems, and the user’s satisfaction. Plus, managed print services benefits businesses in impactful ways. 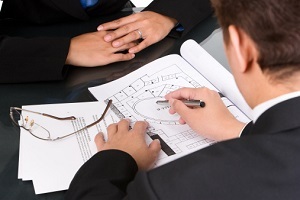 Here's a look at how a managed print service (MPS) program could benefit your company. Although your IT Department may be capable of analyzing your print fleet, is it the best use of their time? An MPS provider has experience analyzing print fleets of all sizes. They also possess specialized knowledge in printer fleet consolidation methods to ensure your business implements the proper equipment at an affordable price. This analysis will consider all aspects of your business' printing needs including scanning, printing, copying and faxing. One of the first things to be assessed is the need and use of local printers. Typically, they are inefficient and more costly than realized. These printers only service one user and are rarely networked, making them inefficient in most business environments. They also often require unique cartridges that are more costly and prone to purchasing and inventory tracking challenges. Placing your printing equipment in easily accessible areas for an appropriate amount of employees will help improve workflow and maximize your device usage. Easy accessibility to this equipment is critical to the effectiveness of your employees. Too often, time is wasted walking across the building or to another floor for printed material. This decreases your employee's ability get their work done. Managed Print Service providers can help you identify which machines are underperforming and replace them with more efficient devices. MPS providers are knowledgeable specialists that know the best printing devices available for your business needs and your budget. They'll consider things like your printing history and your business goals. Eliminate the need for ordering toner cartridges by entering into an MPS program. These programs can monitor your devices and automate shipment of toner based on when your machines run low. Keep your employees productive by eliminating equipment downtime caused by lack of supplies with an effective managed print services program. MPS programs enable you to consolidate your costs (and vendors), which provides the ability for a consistent monthly investment. By entering into a partnership with an MPS provider, there will be no more surprise maintenance or unpredictable printing costs. IT departments are often focused on their regular tasks. Training employees and fixing their printing problems isn’t their top priority and usually is the first task to get put on the back burner. Managed Print Service providers can assist in employee training and provide help desk support for print issues. With mobile printing, your employees will be able to print remotely from off-site locations, from any device. This could provide many improvements for your business. For example, an employee doesn't have to come into the office to print important paperwork and other employees don't have to spend precious time looking for the document to print for them. If your business supports a mobile print environment, MPS providers can help establish, maintain and provide troubleshooting support.